May 2010 be filled with good health, prosperity and happiness. Oh, and another World Championship, this one at the expense of the Yankees! The passing of loved ones is always difficult, no matter the time of the year. The Phillies family has lost four men in the last couple of months. A couple wore the uniform a long, long time ago and a couple didn’t wear a baseball uniform but they were part of the game and the fans’ experience. Eddie Ferenz didn’t wear a uniform, yet he had impact on Phillies fans. He first began working for the Phillies in 1967 as the PA announcer at Connie Mack Stadium. Three years later, he became the traveling secretary, a position he held full time until he retired in 1999. The traveling secretary job is a stressful one. Moving 40-50 people around the country to meet the baseball schedule isn’t easy. He did it well and with class. We knew him as “Fast Eddie”, “Eddie Spaghetti”, the “Great One” and the “Fast One.” Not sure how he got those nicknames. To some, he was the “Pope of Clearwater.” Eddie loved Clearwater. An army of friends, including “Eddie’s Girls”, his fan club, gathered at the Beachcomber Restaurant on Monday night for a toast to their friend. Burial was at 12 noon on Monday in South Jersey. Until the Phillies placed a minor league team in Clearwater, Eddie ran the ticket office during spring training. It wasn’t as big business as it is today but it was a job that required no days off for six-seven weeks. Then, there was Seymour “Pops” Steinberg. Many may not know his name but if you bought a hot dog, ice cream, soda or cotton candy, chances are you got it from him. Pops was a little guy with a sharp voice who was a vendor for Phillies games, plodding up and down the aisles of three stadiums over four decades. Yep, he worked at Connie Mack Stadium, Veterans Stadium and even Citizens Bank Park. Unable to get around any more, he sold cotton candy from a booth on the 300 level at the Phillies’ newest home. He actually began vending in 1954 working games for the Philadelphia Athletics. His record that year: 77 A’s game and 77 Phillies games. In other words, he didn’t miss a game. Pops saw his first game at Baker Bowl in 1936 as an eight-year-old. That leads to the two uniformed members of the Phillies family who have left us. The first was pitcher Tommy Reis. The 95-year-old died in early November. He’s the last Phillies player who performed in Baker Bowl during the 1938 season. That was his only big league season. Christmas eve, outfielder Stan Benjamin, who played for the Phillies in 1939 until 1942, died, also at the age of 95. 96-year-old first baseman Art Mahan (1940) is the oldest living Phillie. Outfielder Alex Pitko, who turned 95 on November 22, is now second to Mahan. Ferenz, Steinberg, Reis and Benjamin were part of the Phillies family, one way or the other. (During this time of the year, I like to share a humorous rendition of the “Twelve Days of Christmas.” I first read it some 40 years ago in a Wilmington News-Journal column, “Ala Carte”, written by Sports Editor Al Cartwright. Al was my mentor at the N-J before I joined the Phillies in 1963. I chuckle every time I read it. Hope you enjoy it). Everyone has a favoriate Christmas carole and everyone remembers receiving a special toy as a child. So, we asked several Phillies Alumni for their favorites. Hope you enjoy their answers. Will post one more time before Christmas and once before the new year. So, Happy Holidays to all! Harry Leroy Halladay III is better known as Roy or “Doc.” The nickname Doc comes from Doc Holliday, the dentist, gambler and gunfighter of the American Old West. That Doc also came to Philadelphia as a 19-year-old dental school student in 1870. While the Phillies’ new pitching ace was in Philadelphia, he and his wife, Brandy, looked into purchasing a home. No dental school for this Doc. Brandy also spoke with the Phillies about how she and her husband can get involved with helping children. In Toronto, Doc and Brandy invited children and their families from the Hospital for Sick Children into “Doc’s Box” at Rogers Centre. Each child received a Doc’s Box t-shirt, hat, program and Blue Jays goodies while watching a game from his private luxury suite. Last night, Doc was among several Philadelphia sports celebrities at the 76ers game. When introduced, he drew the loudest response. MLB and the Phillies have No. 34 Halladay jerseys on sale already. The Phillies’ new, updated 2010 promotion schedule includes a Halladay Bobble Figurine for May 18 (Pirates), courtesy of Toyota. Because of the depth in their minor league system, the Phillies were able to acquire Cliff Lee last July and Doc yesterday for seven total prospects. Don’t forget 2B Adrian Cardenas, LHP Josh Outman and OF Matt Spencer were sent to Oakland in July of 2008 for Joe Blanton. Joe’s gone 16-8 in a Phillies uniform and has pitched in back-to-back World Series. “For some reason, the Phillies’ front office smarts are being cast in doubt by a segment of their fan base asking why they are simply switching Cy guys in a megaswap with the Jays and M’s, while giving up a trio of top prospects to the Jays and receiving three from Seattle. Doc won 20 games twice with the Blue Jays (2003 and 2008). Last Phillies 20-game winner? Steve Carlton, 23-11, in 1982. Doc was five years old. “Wheels” was referencing the fact news often got out before we announced it. That was during the time when there were electric typewriters, old-fashioned telephones, no voice mails. Sorry, Pony Express had long passed. A major news conference was held in the Media Room at Citizens Bank Park late this afternoon to confirm two trades. In today’s world of instant news (cell phone, internet, texting, twitter, facebook and whatever else there is), these trades have dominated the news since Monday. It became a game of hide and seek. Ruben and his staff and the PR staff had to hide from the seeking media until everything was finalized this afternoon. Now, in a room as packed as it was for the postseason the last two autumns, we introduced our new pitching ace. 12 TV cameras were lined up in the back of the room, including one from Toronto. Halladay wore #32 with the Blue Jays but that number is retired for Steve Carlton. So, he’ll wear #34, which was Cliff Lee’s uniform for three-plus months. #34 has become quite a collector’s dream. Nine weeks from today, he’ll report to Bright House Field in Clearwater along with the other pitchers and catchers. First workout is the next day. Can’t wait. Looking for another holiday present, Mother’s Day gift or something for dad for Father’s Day? There’s a new official Phillies publication on the way: Phillies: An Extraordinary Tradition, 256-page definitive history coffee table book. Insight Editions is the publisher. Come early May of next year, the book will be available. But, fans can purchase the book in advance online now. Billing won’t take effect until the book has been shipped. There are seven chapters: The Early Years, The Whiz Kids, Heartbreak, Champions at Last, Return to the World Series, Hall of Fame and Back-to-Back. It all starts with a distinctive look at the City of Philadelphia in 1883, the Phillies’ first year. The publication’s primary focus is photography. Over 400 images capture faces and places in Phillies history. Many are rare photos. My favorite is a lunch break scene during spring training 94 years ago. It is among 10 images that are featured online. Rusty Kennedy, retired AP photographer, did most of the digging for photos. Numerous sources were used. Rusty scanned old photos and enhanced them, to look brand new. The book has been a year in the making. Final color proofs arrive the first week of January and then it’s off to the printer and binder. Insight Editions, a division of the Palace Publishing Group, first ventured into sports a couple of years ago, producing Knockout, The Art of Boxing and San Francisco Giants, 50 Years. Baseball America, the national baseball publication and website, has named the Phillies the Organization of the Year for 2009. The announcement came yesterday at the Winter Meetings in Indianapolis, IN. When the last decade ended, the Phillies were coming off six straight losing seasons and 732 wins for the 10-year period. But, their minor league system had young prospects that would work their way to the majors, Pat Burrell, Jimmy Rollins, Ryan Madson, Brett Myers, Carlos Ruiz. Joining them this decade were Cole Hamels, J. A. Happ, Ryan Howard, Kyle Kendrick and Chase Utley. When the decade ended the Phillies had 850 wins for the 10-year-period, three consecutive NL East titles and back-to-back trips to the World Series. All were firsts in franchise history. While credit starts with those in authority at the top of the Baseball Administration Department, the unsung heroes are some 80 people toiling in the trenches: scouts, managers, coaches, instructors, athletic trainers and conditioning coaches. While I haven’t seen a chart of past winners, I do recall the Phillies winning the award in 1969. Things were bleak at that time but the farm system had the likes of Larry Bowa, Denny Doyle, Greg Luzinski, Bob Boone, Rick Wise and John Vukovich on the way to the majors. The 1970-1980s era turned out to be a great one. We are living one even greater. Phillies Insider is on philaphillies.twitter. Baseball’s winter meetings are next week in Indianapolis. Trades and agents peddling their free agents will dominate the news. This Indiana city will need to change its name to “Rumor City” for a few days. Ruben Amaro Jr., for the second year in a row, has gotten a jump on his shopping list before the meetings. Last year, he signed Raul Ibanez early. Today, Juan Castro and Placido Polanco joined Brian Schneider (Tuesday) as new Phillies. Three key additions in one week. Schneider grew up in the Lehigh Valley and was a Phillies fan as a kid. He, too, came back home because he wanted to play for a winner. Castro had other opportunities but again, being on a winning team was the deciding factor. Phillies Wall of Famer Juan Samuel coached both Polanco and Castro. “I tell you what, they are real professional people who will be great fits in your clubhouse,” Samuel said from his Florida home. “Castro can play anywhere in the infield. Polly, the only time I saw him at third was when he was with you. But, he’s played there before, has good hands ane enough arm strength. He just needs to play there every day. He’ll get used to it. Now, Ruben’s focus shifts on adding bullpen depth and possibly a starter. Todd Zolecki will bring you all the winter meeting news on this site. Stay tuned. Ten weeks from today, the Phillies equipment truck will be loaded at Citizens Bank Park for a journey south to Clearwater. Phillies Insider is on twitter as philaphillies. Good news on Brian Schneider joining the Phillies. He was a Phillie killer, 6 homers, 53 RBI, most against any NL team (going into 2009). Did you know he caught the first pitch in the history of the Washington Nationals, a called strike from Livan Hernandez at 3:07 p.m. on April 4, 2004, at Citizens Bank Park? He’s a grad of Northampton (PA) High School in the Lehigh Valley so he’s coming back home to play ball. We share the NL crown which is pretty impressive. A day late….happy 29th to Shane Victorino. Since he made the last out in the WS, he hosted a charity golf tournament back in Hawaii, got married and won a Gold Glove. Cyber Monday is gone but there are plenty of online shopping options remaining on this website. Starting on Friday, Phillies Six Packs will go on sale online for the first time, the first chance to buy individual game tickets for next season. You get to pick six games (some restrictions apply). Great stocking stuffer. 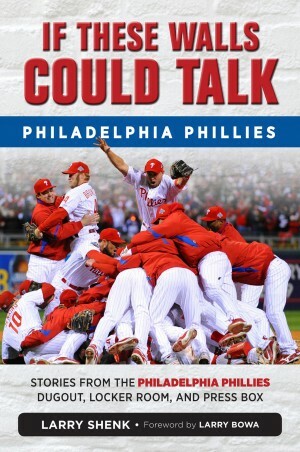 One of the best sports books this holiday season is View From The Booth by Phillies broadcaster Chris Wheeler. Very entertaining publication filled with behind-the-scenes stuff. 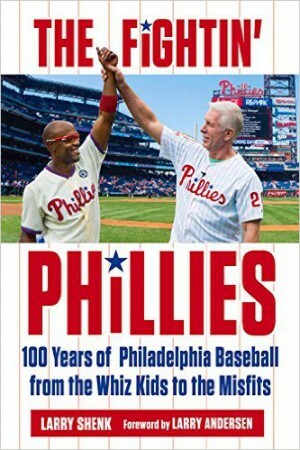 He’ll be signing copies of the book this Saturday, the first of a weekend Holiday Sale at the Majestic Clubhouse Store at Citizens Bank Park. Baseball Hall of Fame Museum has opened the annual Autumn Glory exhibit featuring the two World Series teams. Obviously, the Phillies have a lesser role this year. But, many of their items from last year’s display will soon resurface in the timeline sector. The cap worn by Cliff Lee (4-0, 1.56 in five postseason starts) and a bat Chase Utley used in the World Series when he hit a record-tying five homers, are part of this year’s Autumn Glory display. The Museum is open every day of the week, year round, except for Christmas, New Year’s and Thanksgiving. Trip to Cooperstown is a great family holiday gift. Be sure to take a snow shovel if you are going this winter. Going to bow out of the twitter world (barons63). Thanks to all of you who have been followers. Instead, I will be a contributor to philaphillies, the official twitter of the Phillies. So, sign up, if you haven’t already. Never did get into facebook, however. Always said I have a face for radio!